“Let’s do the Randonneur Round the Year challenge for next year” said Dave. Esmonde duly replied, “Yes, I’m up for that”, then they both looked at me, “Yeah, why not”, what else could I have said. It’s early December 2016 and we are in a restaurant and after a few glasses…or bottles of wine this seemed like an interesting challenge for 2017, plus it was four weeks away and everything seems easily doable when so far away! Randonneur Round the Year (RRTY) is awarded to any rider who completes at least one approved Audax ride of minimum 200k each month for any 12 consecutive months. They are self-supported meaning any mechanical issues you have to fix them yourselves. To put the challenge into perspective I have done a few 200km rides, all of them during the summer and would limit one to two rides a year, using the winter / spring as a build up to the main events. 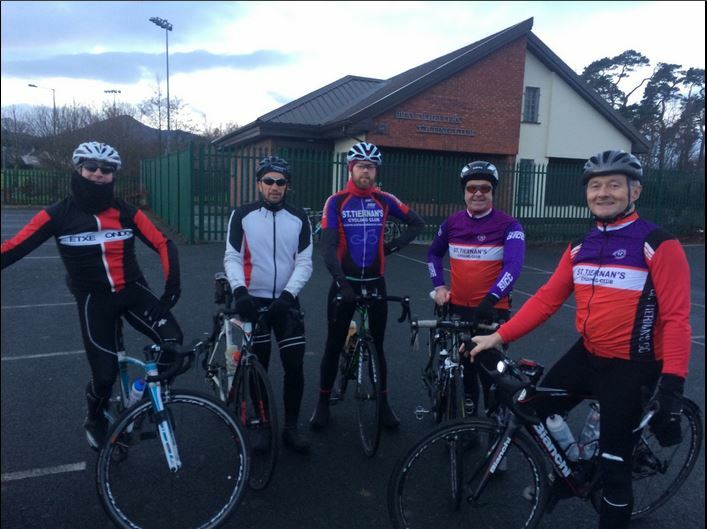 28th January we gather at the Bray Wheelers club house for the Ardattin 200. It’s 7:30am and it’s cold. I get ready, clothed with winter gear and enough food to feed a small Ethiopian village! We ride this as a permanent thus it’s just the three of us. The route is undulating and I soon get left behind. I am grossly unfit and set my own steady pace….this is going to be a long day. Dave and Esmonde wait for me at regular points. All is going well until darkness hits and the realisation myself and Esmonde do not have appropriate lights, we still have another 40km left and need to ride through unlit country roads. A brief lecture on lights follows from Dave. We carry on and Dave provides the lighting and we complete the ride. The next ride is the Kings Mountain 200 and due to our availabilities myself and Esmonde ride this on 26th February. Dave did a solo ride one week earlier. This time I am fully prepared with appropriate lighting. I know what a lumen is and how many I need! We are under some pressure to get our ride completed as it’s the only day we have to get our second ride completed for the challenge, furthermore storm Eoghan is forecasted on the day, this was going to be fun….and it was! We start from Whitechurch, all is going well a bit breezy but that’s all. As the morning progresses the weather gradually worsens and it becomes wet and windy. Inevitably, Murphy’s Law comes along and we get a puncture. By this time the storm is in full swing and we decline the offer of a warm car as we change the tyre with numb fingers, pump the tyre and we’re off. We ride less than 10km and the wheel punctures again. Altogether we had to change the tube four times in the space of 15km as something was lodged in the tyre and the weather conditions made it difficult to locate. Although we found the culprit we had emptied our supply of tubes. We were in the middle of the countryside, huddled in a cow shed in a storm on a Sunday and in need of tubes. A local person suggested a garage where we might be able to get tubes but this would be an additional 20km in the opposite direction. Rather than take the risk we backtracked. One of the things that the rides impress on you is how incredibly helpful total strangers all around the Irish country are. The garage man doesn’t have tubes but rings someone he thinks might have them who drives down to us to deliver same and doesn’t want any payment. Similar acts of spontaneous kindness and welcome were experienced right throughout the year irrespective of where the ride took you. We carried on to Crookedwood where we stopped for a sandwich and cuppa (and watched Italy win the first half against England!) The time was 15:30 and we had another 100km left! We rode the last 80km in the dark, had another puncture and arrived home at an ungodly hour. What an experience…but we made it and our challenge is still alive. As the months progress we continue our monthly rides, longer days with improving weather helps, along with better organisation ensuring we do not leave rides so late in the month. After a few rides it becomes a routine and I actually start looking forward to them. With improving fitness I also learn about my dietary requirement for long rides and realise I don’t need to bring along most of Aldi’s sugar section. The rides pass with no dramas, after all we are well experienced randonneurs by now, with the different routes we see many locations, monuments and I receive the occasional history lesson along the way. We complete our final ride on 2nd December, riding the Gheimhridh 200, where there is food available at the finish, kindly arranged by the event organiser Marc at his family house. There is cooked food, sweets and soft drinks all prepared by his family. 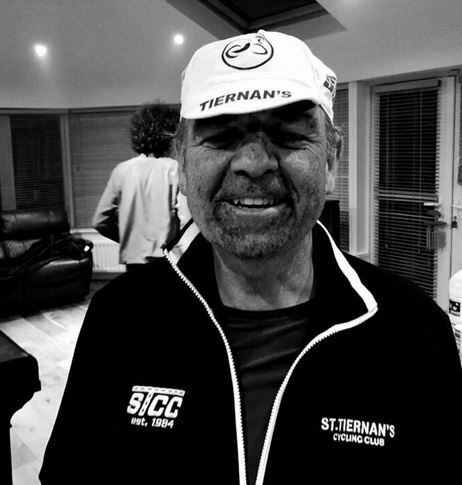 Older and Wiser: Kells with 50km left to the finish. Sitting around the table, finishers come in dribs and drabs and it becomes apparent everyone knows each other as they share comical stories about individuals and rides. I guess Audax riders are a close knit group who come together regularly for such rides. As for myself, naturally I am pleased in fulfilling this challenge, along the way seeing many new parts of Ireland, learning and improving my physical and mental strength. Finally, if you are a medal whore, like me, there is a RRTY medal; this in itself makes it worthwhile! 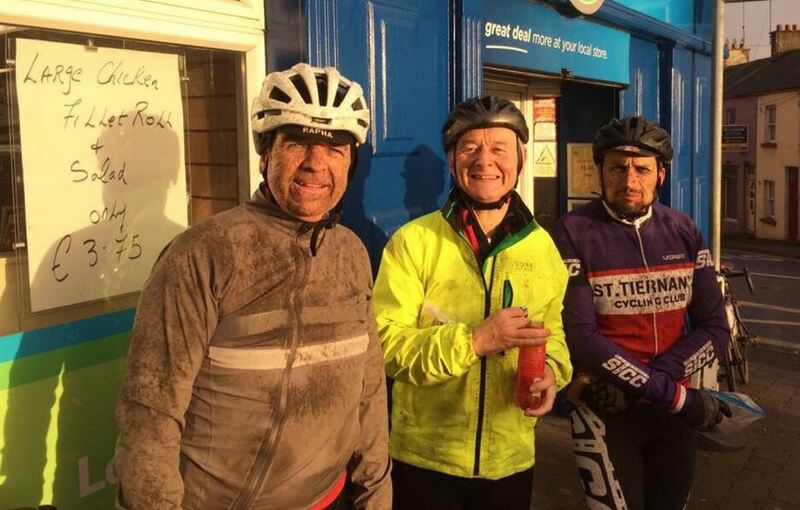 Gheimhridh 200 – Dave Corr illustrating how you look after 200km when your fellow riders don’t bring mudguards! I had previously done several Audax events but never had strung out a number of them month after month, this in itself requires mental (and family!) preparation as it means giving up one day a month to these events, in addition to maintaining form to keep it going. Still, it was great to do it as a group as I know having the lads make up for my lack of motivation on one or two months meant I would be more likely to finish all twelve! With such long rides there’s also plenty of opportunity for good craic and once we got past the epic adventures of the early months we settled in to a good rhythm and even became more disciplined about sticking together! There were several highlights – picking out particular events, the Mick Byrne 200 is always a good event and the Yola 200, despite the wind was great and it was good to base ourselves in Kilmore – not having to drive back to Dublin that evening was great and meant we could enjoy a great evening meal at the curiously named Mary Barry’s (a restaurant I first noticed as we sped by it at some ungodly hour a couple of weeks previously on the RAI!). Thankfully there were few low points, cramping on the climb up to the Dying Cow pub and the complete loss of function due to a head cold on the Gheimridh 200 – this was the last of the twelve so determination and support from the lads got me round!! 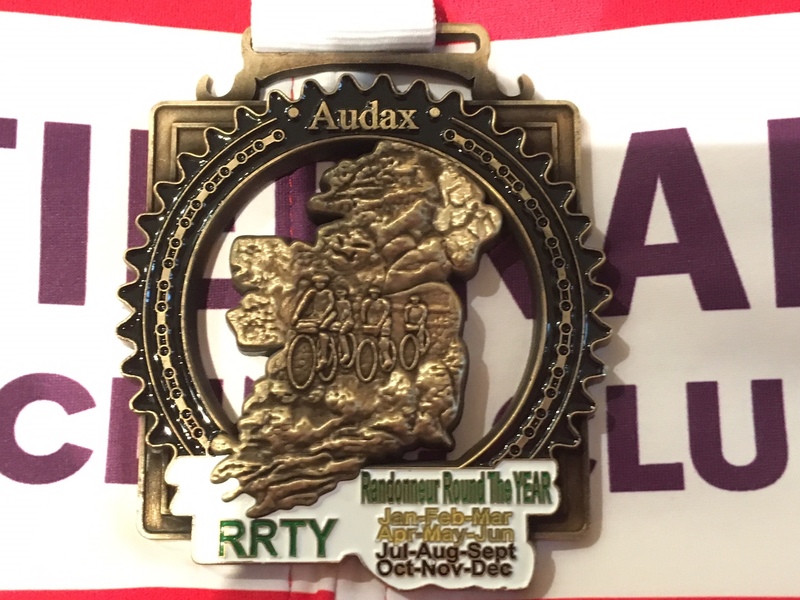 I’m glad to have completed the set, and as usual, the crowd from Audax Ireland have been great and very supportive though listening to some of the rides they do – I am not sure I am cut out for a PBP, or LEL….. The RRTY, while at the start is tough, becomes more and more enjoyable as you learn from your experiences and start to meet the same people on the organised rides. Be clear with your wife/partner as to what you are doing and that it is likely to finish in twelve months’ time. It is nice to still have a home to come home to! While we did it from January to December, you can start it in any month and some people may prefer to start it in the summer and get the first couple of rides done when the weather is kinder and the days are longer. A mixture of organised Audaxes when the dates are suitable alongside permanents which we rode ourselves works well. Check the ride is recognised by Audax Ireland, the Wicklow 200 for example is not and you will have to do another approved Audax that month. If doing a permanent find who the organiser is for that route and pre-register with them (cost is generally €5 for the registration and another €5 if you want a medal for completing it). Maximise the daylight as you get into the winter by doing rides early in October to December and the opposite after the New Year. Keep an eye on the maximum time permitted to complete the ride. If possible do it with a couple of mates, the lift it gives you on those days when you are below the weather and coughing your guts up or pushing a lead weight up a hill, is immeasurable. Stop off in places (but not more than once or twice and not for too long, stay away from watching rugby matches!). If your Garmin or Strava dies on a Permanent, buy stuff in shops and keep receipts to produce as proof as well as taking a couple of photographs along the way. Buy a very strong front light for the winter rides. Charge everything, Garmin, torch batteries to the max and have a backup regular front light in case your main one runs low. Bring electrolyte tablets with you and keep adding them to your water to avoid cramp particularly when restarting after a break. During the winter try to locate your breaks before a relatively flat section to warm up again before you head back up hills. Fit a long mudguard to your rear wheel during winter rides. You don’t want to be hanging out with filthy fellow cyclists! Particularly during the first couple of rides it may seem like a daft and never ending drag. I have the guys to thank for getting me through them. There are great times to he had and the craic can be, and was, brilliant.